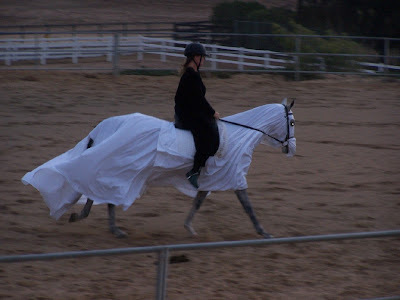 A Collection Of Horse and Rider Costumes... Created as a guide for anyone interested in entering a fancy dress coustume class. If you have a Fancy Dress Costume photo or idea you'd like to share, please email me at algi_p@hotmail.co.uk. Most of these photo aren't mine and If your photo is posted here and you'd like it removed, Please just let me know. 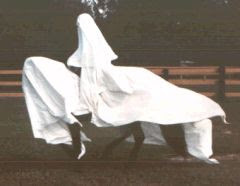 With the effort of training you horse to get used to the sheet flapping around this could be the cheapest most effective halloween horse fancy dress costume as all you need is some sheets. 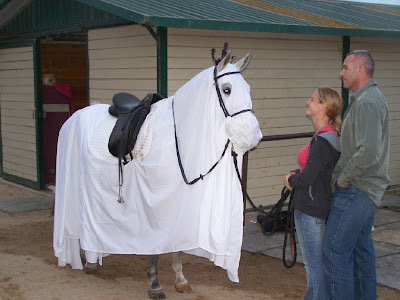 Though I wouldn't advise doing the 3rd picture in which the horse's head is actually completley covered so the horse is 100% relieing on the rider. Thanks for sharing your photos in your lovely blog. There are some great ideas here. I'll be adapting one or other of them for a bicycle for this weekend, and another one for a llama in October. I'm very grateful for the inspiration. Have you found this blog useful?